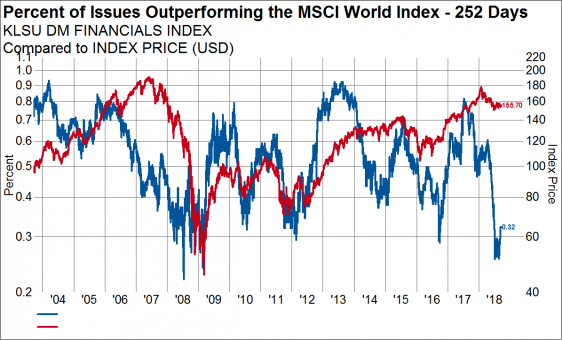 Over the summer, some groups within the global equity market sold off sharply, leading to the current trends of poor performance and weak breadth. 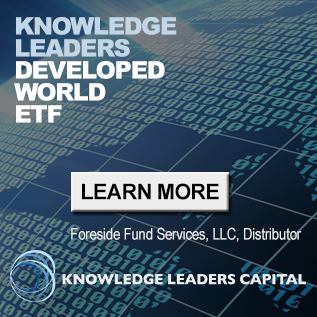 Foreign stocks, cyclicals and value-oriented sectors were the hardest hit. From here, we expect better trends from these groups as they have become statistically washed out. We calculate the percent of stocks outperforming the MSCI World Index as a gauge of market breadth and risk. From a risk standpoint, when the percent of stocks in a given group outperforming is falling, our chances of picking an outperforming stock are reduced. And, when the percent of stocks outperforming is rising, our odds of picking an outperformer increase. 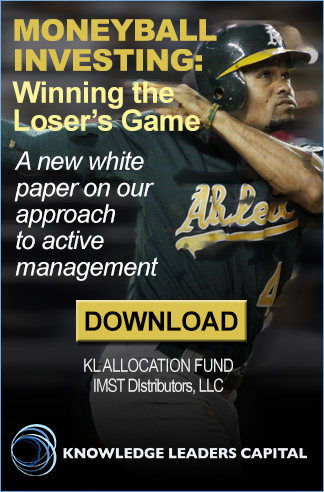 So, we pay attention to the historical trends of outperformance as an input to asset allocation. As of yesterday, only 38% of stocks in the Developed World were outperforming the MSCI World Index over the last 252 days. This is the lowest reading in 15 years and suggests that many areas of the equity market have underperformed significantly, presenting opportunity. 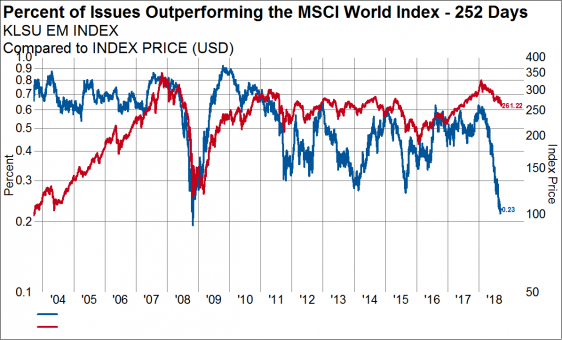 Even in the US, where stocks have held up much better than foreign markets, only 51% of stocks have outperformed the MSCI World Index over the last 200 days. I want to highlight some of the areas that could be ripe for a mean-reverting bounce. From a geographic standpoint, developed Europe and the Emerging Markets are the most oversold. When less than 30% of stocks have outperformed, this indicator is oversold. In Europe, 29% of stocks have outperformed and this represents a level from which European stocks have bounced over the last 15 years. Periods like 2008, 2012, 2015 and 2016 all marked lows where stock prices bounced. The Emerging Markets have only been this oversold once in the last 15 years, at the depths of the financial crisis in 2008. 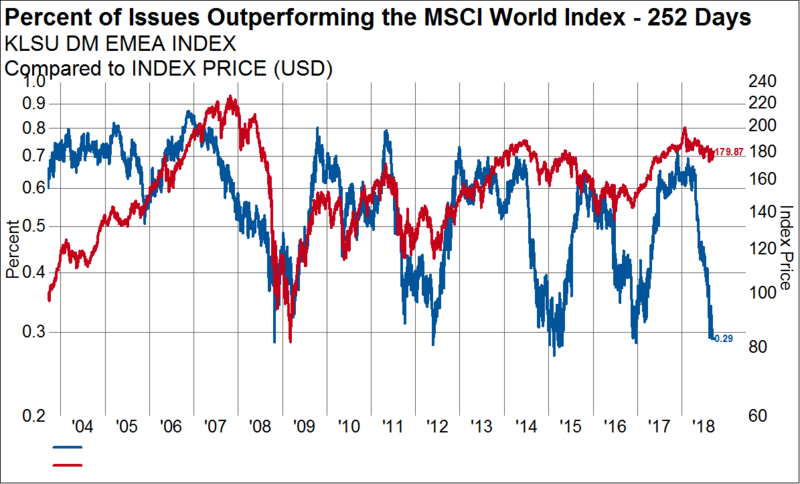 Currently only 23% of Emerging Market stocks have outperformed the MSCI World Index over the last 200 days, a worse showing than during the 2011, 2015 and 2016 lows in global equities. Turning to sectors, there are two in the Developed Markets that have recently hit the 30% outperforming threshold. While financials are a few days into their bounce as bond yields rise around the world, last week they hit a reading of 26%, meaning three-quarters of the financial stocks in the Developed World have underperformed over the medium term. 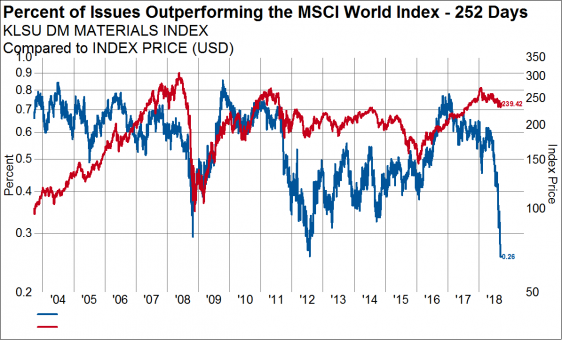 Stocks in the developed materials sector are the next bounce candidate. Currently only 26% have outperformed over the last 200 days, which is the lowest reading in 15 years … several percentage points lower than the bottom in 2008. In the Emerging markets, the industrial sector stands out as the biggest bounce candidate. A mere 12% of stocks in this group have outperformed, leaving 88% of all EM industrial stocks to have underperformed. 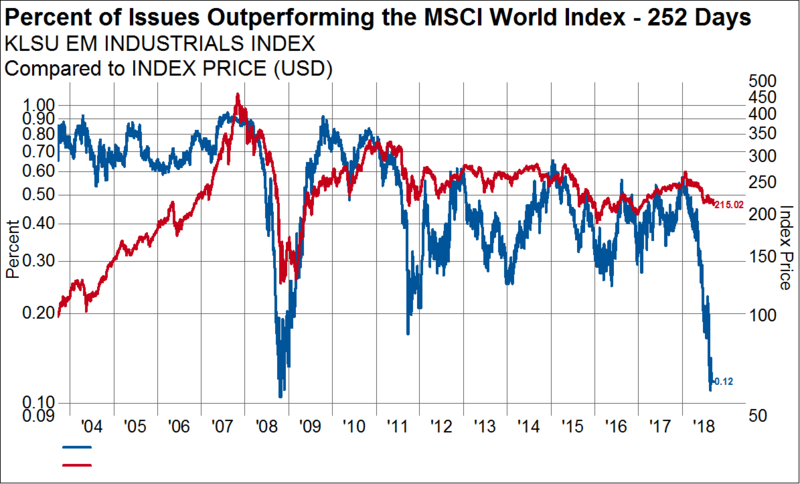 When a similar reading was registered in 2008, EM industrials enjoyed a 100% bounce in the ensuing two years. Given how washed out these readings are for many groups around the world, it may make sense to think about what a mean reversion may look like. A potential increase in the number of stocks outperforming is a good statistical backdrop to increase equity allocation.